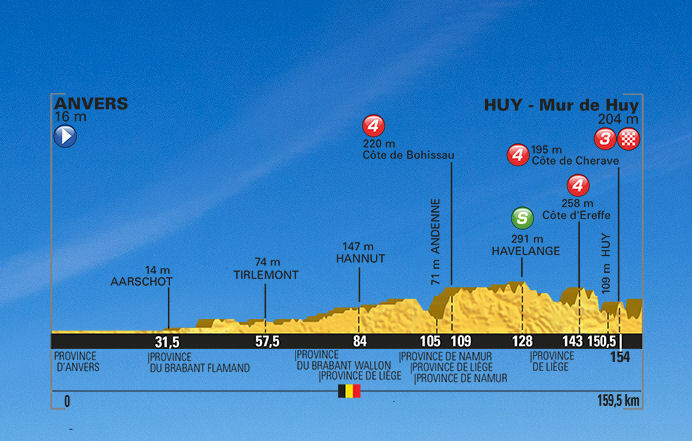 The stage ends with the iconic climb of the Mur de Huy, the 1-km staple of the middle course of the Ardennes classics, the Fleche Wallone. In addition to the tough finishing climb is the Cote de Cherave, a 1.3-km 4th category climb of 8.1% average gradient, which is found at 5.5 km from the finish. Click on map and profiles below to enlarge, then scroll down and click to supersize.